Saturday Night Genealogy Fun -- How Many Elizabeth "LNUs" are in Your Family Tree Database? 2) How many "Elizabeth" persons without a surname do you have in your genealogy database? How many of them are your ancestor? 4) Tell us about your Elizabeth LNU ancestors with no surname. Perhaps someone will read it and help you out! 6) NOTE: If you don't have any "Elizabeth" persons without a surname, then pick another female first name. I have 150 Elizabeth LNU persons in my database of 44,917 persons. 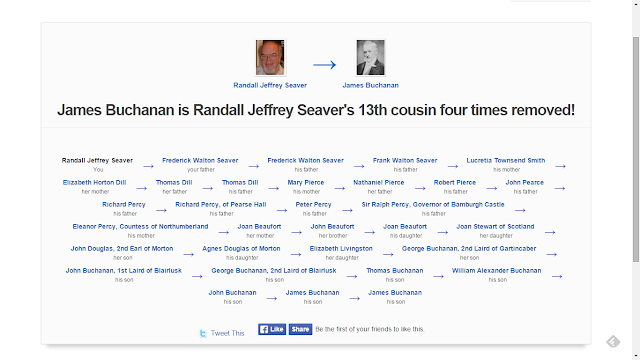 39 of them are my direct-line ancestor. Almost all of them are persons born before 1700, and many of those were born before 1600. 1) Elizabeth --?-- (1731-???? ), married in about 1760 to Henry Pickel (1729-1765), and mother of Baltus, Gertraut, Elizabeth and Henry Pickel. 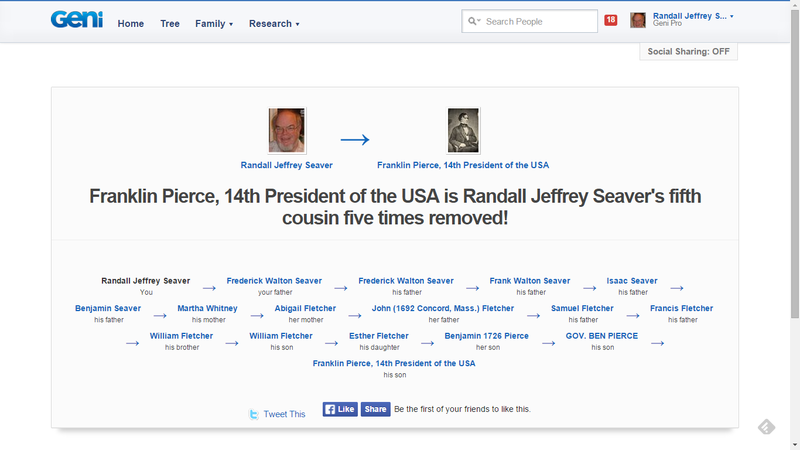 Elizabeth Pickel (1764-1849) is my ancestor, who married Jacob Sovereign (1759-1845). 2) Elizabeth --?-- (1683-1750), married in about 1705 to John Terrell (1680-1748), and mother of William, Amy, Mary, Mary, Thomas and John Terrell, all born in Somerset, England. Amy Terrell (1708-1780) is my ancestor, who married James Vaux (1704-1776). 3) Elizabeth --?-- (1673-???? ), married in about 1699 to Samuel Ayers (1669-1740), and mother of Rhoda, David, Elizabeth, Samuel, Jacob, Rachel, Benjamin and James Ayers, all born in Woodbridge, New Jersey. James Ayers (1716-1794) is my ancestor, who married Hope Bloomfield (1715-1776). For these three Elizabeth LNUs, I looked on Ancestry Member Trees using the spouse's name, and did not find any real help. There are too many entries and they are not ordered in any rational way. 1) Elizabeth --?-- who married Henry Pickel: no maiden surname or parents are given for this Elizabeth (--?--) Pickel. 2) Elizabeth --?-- who married John Terrell: no maiden surname or parents are given for this Elizabeth (--?--) Terrell. 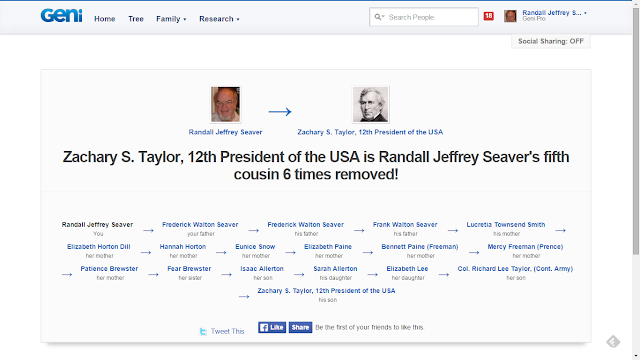 3) Elizabeth --?-- who married Samuel Ayers: the Samuel Ayers that matches my Samuel Ayers well has a wife's name of Elizabeth Tuttle (1670-????) listed, with a marriage date of 17 November 1693 in Haverhill, Mass, but with no parents names listed. This is a definite possible - I need to check the marriage record and Tuttle probate records in Essex County, Massachusetts to see if one of them named Elizabeth Ayers as a daughter. 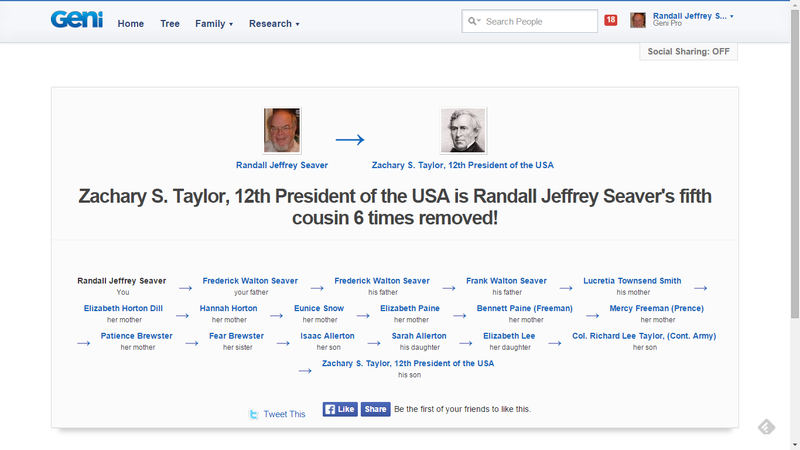 I am in the 8th great-grandmothers and I'm up to Ancestor #1145 who is Elizabeth SMITH (1648-1733) [Note: the earlier great-grandmothers and 8th great-grandfathers have been covered in earlier posts]. 1144. Jabez Snow, born 1642 in Plymouth, Plymouth, Massachusetts, United States; died 27 December 1690 in Eastham, Barnstable, Massachusetts, United States. He was the son of 2288. Nicholas Snow and 2289. Constance Hopkins. He married before 06 September 1670 in Eastham, Barnstable, Massachusetts, United States. 1145. Elizabeth Smith, born 16 September 1648 in Hingham, Plymouth, Massachusetts, United States; died after 08 January 1733 in Eastham, Barnstable, Massachusetts, United States. * Edward Snow (1672-1758), married 1707 Sarah Freeman (1676-1739). * Sarah Snow (1673-1746), married (1) 1695 Henry Young (1672-1706); (2) 1711 Jonathan Sparrow (1665-1740). * Grace Snow (1674-???? ), married (1) 1698 Samuel Hedge (1675-1714); (2) 1716 George Lewis (1673-1769). * Deborah Snow (1680-1732), married 1706 Stephen Merrick (1673-1732). * Rachel Snow (1685-1765), married 1717 Thomas Huckins (1688-1774). * Elizabeth Snow (1688-1713), married 1704 Edward Kendrick (1680-1743). * Mercy Snow (1690-???? ), married 1710 John Wetherell (1675-1725). 2290. Ralph Smith, born before 06 April 1612 in Hingham, Norfolk, England; died 27 October 1685 in Eastham, Barnstable, Massachusetts, United States. He married before 1640 in probably Hingham, Plymouth, Massachusetts, United States. 2291. Elizabeth Hobart, born 1612 in Hingham, Norfolk, England; died before 1660 in Hingham, Plymouth, Massachusetts, United States. She was the daughter of 4582. Edmund Hobart and 4583. Margaret Dewey. * Samuel Smith (1641-1696), married 1666 Mary Hopkins (1640-1700). * John Smith (1644-???? ), married 1667 Hannah Williams. * Daniel Smith (1647-1716), married 1677 Mary Young (1658-1719). * Elizabeth Smith (1648-1733), married (1) 1670 Jabez Snow (1642-1690); (2) 1691 William Merrick. * Robert Charles Anderson (editor), The Great Migration Begins, Immigrants to New England, 1620-1633 (Boston, Mass. : NEHGS, 1995), Volume III, pages 1697-1699, Ralph Smith sketch. * My Relationships to U.S. Presidents - Post 4: Presidents 22-27 (posted 16 March 2015). The common ancestors are supposedly John Plantagent and Katherine Swynford in 15th century England. I doubt that this relationship is correct; my line from John "Pearce" (1588-1661) of Watertown, Mass. back is not in my database. The common ancestors here are Robert Fletcher (1593-1677) and Sarah --?-- (1600-1672) of Concord, Massachusetts. I think that this relationship is correct. The common ancestors here are Randall Baguley (1578-1626) and Jane --?-- (1582-1626) of Wrentham, England. I think that this relationship is correct. The common ancestors here are William Brewster (1566-1644) and Mary --?-- (1569-1627) of Plymouth, Massachusetts. I think that this relationship is correct. The common ancestors here are supposedly William Horton and Isabel Freeman of 16th century England. I don't have parents for Thomas Horton of Milton and Rehoboth (1638-1716) in my database. I doubt that this relationship is correct. 6) I did not check the records for each relationship shown in the charts above. I am confident that my lines back to the immigrant ancestors from England are correct, but I have no idea how accurate the lines are from the immigrants back to some of the common ancestors to the Presidents. 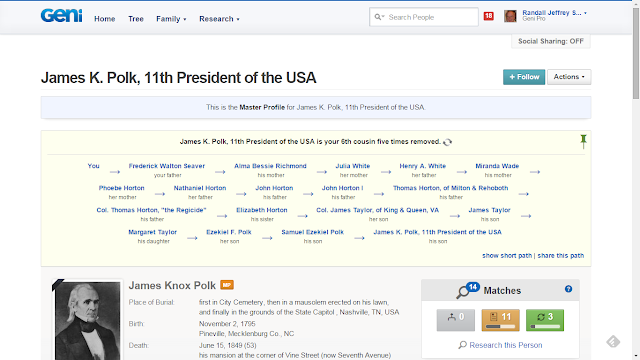 Some are well researched, and have entries in the book by Gary Boyd Roberts, Ancestors of American Presidents (1989). Rudolf Spengler (1738-1811) is #100 on my Ahnentafel list, my 4th great-grandfather, married in 1767 to #101 Maria Dorothea Dinkel (1748-1835). * their daughter, #25 Rebecca Spangler (1832-1901) who married #24 David Jackson Carringer (1828-1902), in 1852. Most of the information available about the Spangler family is from the book by Edward W. Spangler, The Annals of the Families of Caspar, Henry, Baltzer and George Spengler, published in York, Pennsylvania in 1896. Rudolf Spengler was born in 1738 to Johannes Balthasar and Maria Magdalena (Ritter) Spengler, who migrated to North America in about 1732 and settled in Pennsylvania. When the Revolutionary War started in 1775, Rudolf Spangler became a member of Captain George Eichelberger's Company in 1775 and was shortly afterwards elected Captain of the Sixth Company of the York County Militia which constituted a part of the five battalions that marched to Eastern New Jersey in 1776 to form the "Flying Camp." Rudolf Spengler was a silversmith and a clock maker. The author of The Annals of the Families of Caspar, Henry, Baltzer and George Spengler found three "grandfather's clocks" in the 1890's fabricated by him, with the inscription "Rudy Spengler, York town" inscribed on their dials. He was assessed as a merchant in York, Pennsylvania in 1773. He was an unerring shot -- on the morning of his wedding day he went with his gun and deer hounds to Baumgardner's woods a mile southeast of York, where he shot a deer for his nuptial dinner. Rudolf Spengler served as County Treasurer from 1801 to 1805. He was a State Senator and Burgess of York in 1803, and a member of the General Assembly of Pennsylvania in 1810. In 1805 he had patented to him lands in York Township (now Springgarden). He owned lot No. 118 West Market Street which was devised to him by his father, and on which he resided in a two-story brick house. In 1809, he owned lots 9, 11, 13 and 15 on East Market and South Queen Streets. He also owned the triangle on King's Mill Road on the plan made by William Alexander. He owned lots 451, 452, 453, and 454 on King Street, west of the Codorus. He owned a lot on the south side of High Street west of Codorus Creek, adjoining Codorus Creek on the east and lot number 325 of George Ernest Schlosser on the west. "Died, in this borough, at an advanced age, on Thursday last, Rudolf Spangler, Esq. The confidence reposed in the deceased by his fellow citizens in choosing him to serve in the State Senate and House of Representatives, are sufficient testimonials that in private and public life he was the honored and upright man. His remains were yesterday deposited in the German Reformed burying ground, attended by a long train of mourning relatives and friends." June, in the Year of Our Lord one thousand and eight hundred and. he the said George Rothrock believe she did see the said ?????? Rudolph Spangler sign his name unto also both saw him ???? time. Thomas Whittaker George Rothrock. from & compared with the Original at York. J. Barnitz Regr. (???? the agreement between the heirs Recorded)." 1. Edward W. Spangler, The Annals of the Families of Caspar, Henry, Baltzer and George Spengler Who Settled in York County Respectively in 1729, 1732, 1732 and 1751, with Biographical and Historical Sketches, and Memorabilia of Contemporaneous Local Events (York, Penn. : n.p., 1896), pages 181-185, Rudolf Spengler sketch. 2. Samuel Small, Jr., Genealogical Records of George Small, Philip Albright, Johann Daniel Dunckel, William Geddes Latimer, Thomas Bartow, John Reid, Daniel Denezet, Jean Crommelin, Joel Richardson (Philadelphia, Pa.: J.B. Lippincott Company, 1905), page 134, Johann Daniel Dunckel sketch. 3. 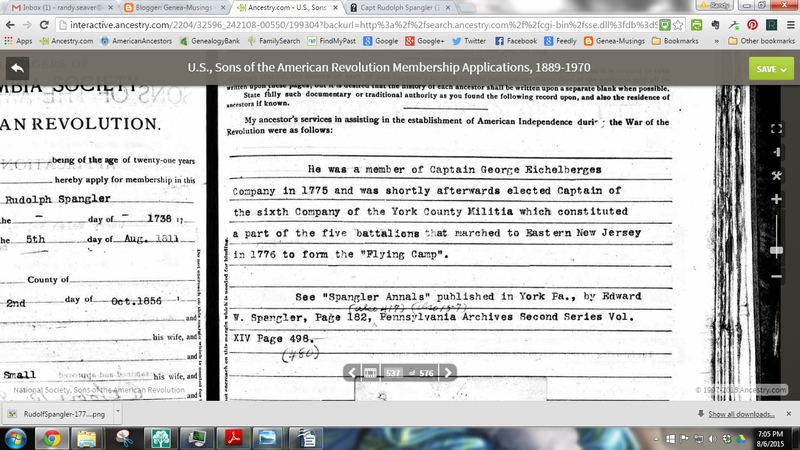 U.S. Sons of the American Revolution Membership Applications, 1889-1970, online database and images, Ancestry.com (http://www.ancestry.com), Application No. 18,191, Henry Welsh Wells, submitted 15 October 1906; Roll 080; citing original data: Sons of the American Revolution Membership Applications, 1889-1970. Louisville, Kentucky: National Society of the Sons of the American Revolution. Microfilm, 508 rolls. 4. 1790 United States Federal Census,, York County, Pennsylvania, population schedule, York, Page 355, Rudolph Spangler household; digital image, Ancestry.com (http://www.ancestry.com); citing National Archives Microfilm Publication M637, Roll 9. 5. "Pennsylvania, U.S. Direct Tax Lists, 1798," digital image, Ancestry.com (http://www.ancestry.com : accessed 21 May 2015), "York (Paradise to York Towships and Botts Town)," no page number (image 178 of 396, Return No. 245, Rudolf Spangler (owner) entry; citing United States Direct Tax of 1798: Tax Lists for the State of Pennsylvania. M372, microfilm, 24 rolls; Records of the Internal Revenue Service, 1791-2006, Record Group 58. National Archives and Records Administration, Washington, D.C..
6. 1800 United States Federal Census, York County, Pennsylvania, population schedule, York, Page 1292, Rudolph Spangler household; digital image, Ancestry.com (http://www.ancestry.com); citing National Archives Microfilm Publication M32, Roll 44. 7. 1810 United States Federal Census, York County, Pennsylvania, population schedule, York, Page 188, Rudolph Spangler household; digital image, Ancestry.com (http://www.ancestry.com); citing National Archives Microfilm Publication M292, Roll 57. 8. Edward W. Spangler, The Annals of the Families of Caspar, Henry, Baltzer and George Spengler Who Settled in York County Respectively in 1729, 1732, 1732 and 1751, with Biographical and Historical Sketches, and Memorabilia of Contemporaneous Local Events, page 181. 9. Jim Tipton, indexed database, Find A Grave (http://www.findagrave.com), Prospect Hill Cemetery, York, Penn., Capt. Rudolf Spangler memorial #70822293. 10. "Pennsylvania, Probate Records, 1683-1994," digital images, FamilySearch (http://familysearch.org), York County, “Wills, 1803-1818, Vol. 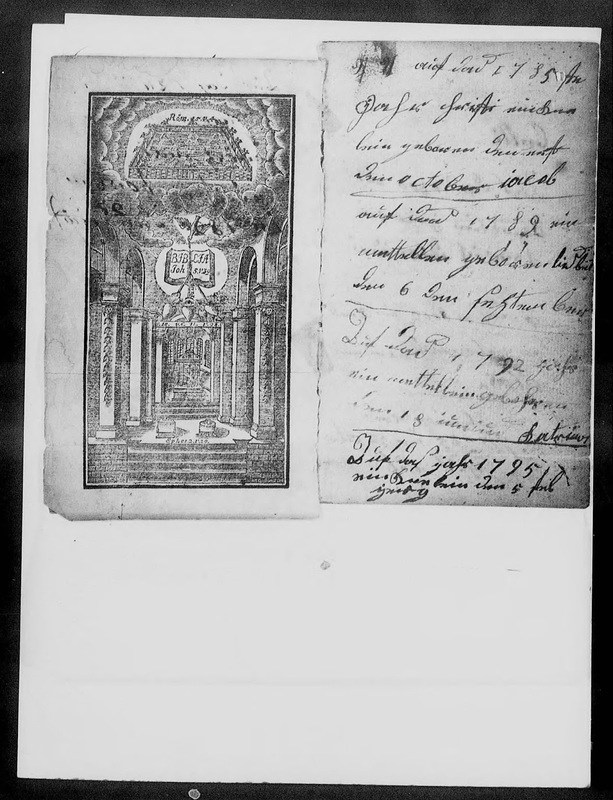 L-N, will of Rudolf Spangler, 180?, in Volume M, pages 348-350, in images 429 and 430 of 800.